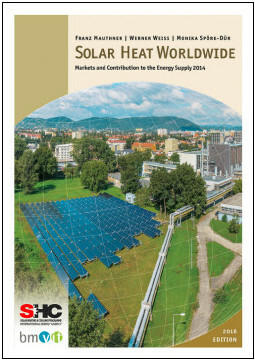 In a first attempt to give an overview of costs for solar thermal systems worldwide, this year's IEA SHC market report Solar Heat World Wide 2016 by AEE INTEC presents a section on solar thermal costs for selected regions and reference systems. The costs were gathered in close cooperation with Task 54 and are also presented in a dedicated webinar "Status of Solar Heating and Cooling Worldwide", aired on Thursday, 30 June 2016 by solarthermalworld.org. For a more comprehensive view on global solar thermal costs, AEE INTEC and Task 54 will continue the data collection for next year's edition and future publications in the framework of Task 54. If you are interested in hearing more about today's global trends in the solar heating and cooling markets by studies of the IEA SHC network, REN21 and Solrico, feel free to follow the recording of the webinar on solarthermalworld.org.